During our week in Central Europe I was fortunate enough to tour two old Jewish quarters: Prague's Josefov, and the Jewish quarter on the Pest side of Budapest. Josefov felt like a museum, Judaism under glass: a monument to a community that was radically truncated during the Shoah, and is struggling to return. (There are about 1700 Jews in Prague today). 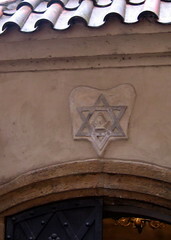 The Jewish quarter in Pest felt, in contrast, like the oldest corner of a community that still thrives. 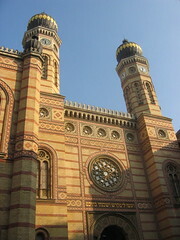 (Today Budapest is home to some 26 synagogues, and a community of 80,000 Jews.) I'm not a historian, so won't write here about the factors that led the two cities' stories to evolve in such different ways; instead I want to explore how the two places felt to me as a visitor and how the experience continues to resonate for me. In Prague we spent much of a day exploring the Jewish Museum -- not a single discrete venue, but rather a series of six locations (most are old synagogues) which now serve as a kind of crystallization of what was once Czech Jewish life. It was Ethan's first visit, though I had been there in 1993 with my mother and grandparents, aunt and cousins. Some of the things I remembered from that trip were still powerful for me this time around. 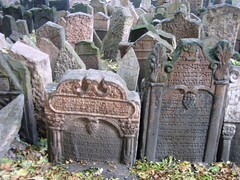 The jumble of headstones in the old cemetary, for instance -- it's Europe's oldest surviving Jewish cemetary, and it's unlike anywhere else I've ever been. It's an amazing, overwhelming, beautiful place, somehow made more poignant by the bustle of commerce and tourism flowing by just outside the cemetary wall. I enjoyed returning to the Staronova ("Old New") synagogue, Europe's oldest working synagogue and one of Prague's earliest Gothic buildings. The interior features a vaulted ceiling and thick walls painted with acronyms which evoke lines from psalms. The brass candelabra hold lightbulbs now instead of candles, and the women's section has grown from its original dimensions, but those are the only visible changes; otherwise it looks much as it must have when it was new. And I really liked the Spanielska ("Spanish") synagogue, which was under renovation in '93 and was therefore entirely new to me. On the outside it looks like another vaguely Baroque Czech building, but on the inside it's a marvel of Moorish arches and ornate non-representative design. I didn't choose to buy a coffee table book or bound postcard set, so I'll have to just remember what it looked like and how it felt to be there. And how that felt to me, this time around, was like Judaism was something static and on-display. Josefov was lined with kitsch, vendors selling tiny clay golems and marionettes with a vaguely rabbinic air: like a memorial gift store. It seemed everything we saw there was about remembering the dead, and I came away wishing the exhibits had also offered a slice of Prague Jewish life today, a sense of how the community continues to renew itself. Our guide book informed me that the synagogues of Josefov were preserved by the Nazis -- as were most of the ritual items we saw on display -- because the Nazis meant for these to become part of their museum of an extinct race. Somehow, knowing that those would-be exterminators wanted to preserve my tradition under glass makes me especially resistant to seeing the Prague Jewish community solely in the context of memory. At a dinner with some of Ethan's colleagues on our last night in Prague, I chatted with an expatriate American who attends the Spanielska during the High Holidays. I came away resolved to make a point of davening there next time I'm in town, to give me a more contemporary sense of Prague Judaism. (Or perhaps I will look for Bejt Simcha, the Liberal congregation in town, about which I have just now learned.) I went to a morning minyan at the Staronova in 1993, and was predictably distanced by the experience of sitting behind the thick wall of the women's section; I suspect that today I would find it more navigable, and would likely find the Spanielska or Bejt Simcha more comfortable still. Either way, praying with other Jews in the city of my mother's birth would help to balance my sense that the community is more a memory than a reality. My Budapest experience was very different. Maybe because I didn't saddle it with the weight of expectations in the same way (I have no roots there, after all, which frees me to explore it merely as an interested tourist), and maybe because the thread of connection between past and present wasn't so effectively cut there. We talked about how architecture shapes community. Once the community was given permission to build synagogues, he explained, the question arose of what synagogue architecture might mean. (After all, Jews didn't want to imitate church architecture -- but if a synagogue building wasn't a kind of variation on a church, then what was it, exactly?) They wound up creating a synagogue structure which borrowed liberally from Moorish design, a visual echo of the golden age the Jews had enjoyed in Spain. That style, of course, bears more than a passing resemblance to mosque architecture. A series of twisting little streets led us to a second ornate synagogue. 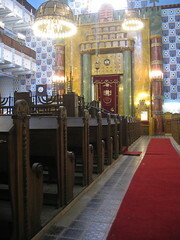 This one was built in opposition to the first one; the Dohany Street shul features a pipe organ, which some of the community adored and the rest of the community found abhorrent. (Plus ça change...) Yes, we told each other the old joke about the Jew on the desert island who builds two shuls, the one he davens in and the one he wouldn't be caught dead in -- we just couldn't resist. That second shul we saw also has a distinctly non-Christian mien: the motifs on its facade are actually borrowed from Aztec designs, very fashionable at the time of its construction (probably thanks to National Geographic and its ilk.) Inside it has been empty for a long time, though its beautiful inlay and designs are being restored. The third shul we visited (pictured above) is an Orthodox shul, still in operation. There we met up with a pair of visitors -- Lubavitch Hasidim, visiting from London -- who had asked permission to see the inside of the shul, and who welcomed us to join them. I let Jeff chat with them as I wandered the sanctuary in delight. Like the other shuls I'd seen, it is beautifully-painted; fewer flourishes, a slightly simpler style, but still more decorated than any American synagogue I've entered, and with a warm and colorful mien. In the courtyard of that shul, there's a kosher restaurant -- one of several in the neighborhood, though most are actually only kosher-style. Later in the day we passed the community mikvah (labeled simply in Hebrew and Hungarian); at one point in our walking tour a rabbi-friend of Jeff's honked at us and waved. We closed out our tour with a look at, among other things, the building that once stood at the edge of the Pest ghetto, and the rooftop across which Jewish artists snuck into the local multimedia artists' organization, for food and culture and conversation before returning to their circumscribed lives. 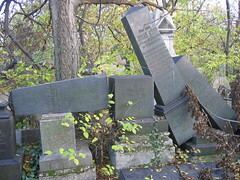 Later that day, I had the privilege of touring the town's old Jewish cemetary with professor and author István Rév, who had thoughtful things to say about burial customs and permanence. The cemetary was stunningly beautiful, and the day felt appropriately autumnal, somehow melancholic and golden all at once. It was mostly more ordered and serene than the hodgepodge of stones that marks the old Jewish cemetary in Josefov, though naturally both places evoked questions of what is transient and what remains. Budapest's Jewish community has a painful history, but its story isn't as tragic as that of the Prague Jewish community; there's more of a sense of continuity between what existed then and what persists now. Now that I'm home again, I keep flashing back to the shelves of kosher products at the grocery store where we stopped to pick up a bottle of wine on our way to dinner our first night in Hungary. Kosher products do not a vibrant community make, of course; neither does any number of synagogues (even if one of them is Szim Shalom, a Progressive congregation with a female rabbi, which I very much hope to visit next time I'm in town!) But I can't help reading the grocery store and the collection of synagogues as a sign of something lasting and present, which is more comfortable for me than a memorial -- however beautiful, meaningful, and awe-inspiring -- to what is past. Technorati tags: religion, Judaism, Budapest, Prague.